I just wanted to do this quick blog post to give you a tip about a recent problem that I had in a SSIS Project. My scenario is the following. As you can see, I need to extract data from this PostgreSQL database and import in SQL Server. So far everything is working, but today I got this error of in one particular table: [OLE DB Destination ] Error: An error occurred while setting up a binding for the “MyColumnName” column. The binding status was “DT_NTEXT”. 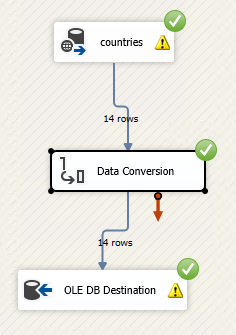 The data flow column type is “DBBINDSTATUS_UNSUPPORTEDCONVERSION”. The conversion from the OLE DB type of “DBTYPE_IUNKNOWN” to the destination column type of “DBTYPE_WVARCHAR” might not be supported by this provider. From what I understood it says this Data Type that the OLE DB Provider tried to convert from the source data is not supported and it resulted in a Unknown data type, which is not supported by the provier. So, how to deal with this problem? 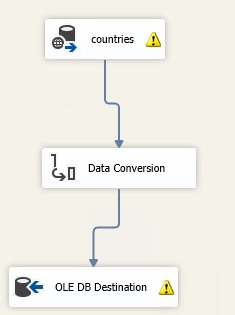 Basically, what I did was creating an intermediate data converstion step as you can see in the below screen. This fixed my error and I was able to execute the data flow task. If you liked or not, give your feedback in the comments. Posted on July 28, 2017, in Dicas, Integration Services, SQL Server, SQL Server 2016, VirtualPass and tagged An error occurred while setting up a binding for the column, berlin, Integration Services, Postgres, PostgreSQL, SQL Server, SSIS, The binding status was "DT_NTEXT". The data flow column type is "DBBINDSTATUS_UNSUPPORTEDCONVERSION", The conversion from the OLE DB type of "DBTYPE_IUNKNOWN" to the destination column type of "DBTYPE_WVARCHAR" might not be supported by this provider.. Bookmark the permalink. 3 Comments. Thanks Dan! Glad that helped you!